Our new Opportunity Quilt is 78" x 78". The design is 13 blocks of the Millenuium Star, paper pieced pattern by Peggy Martin. It was stitched and put together by 14 guild members. The quilting was provided by Shireen Hattan of Folsom, a professional longarm quilter. The quilt will be raffled off at the guild's general meeting on September 19, 2019 at 8:00 pm. 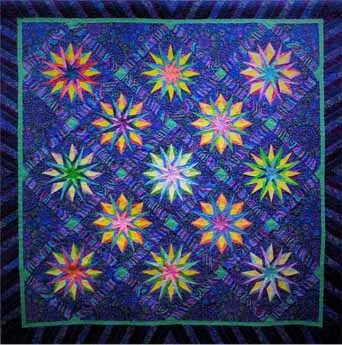 To see the quilts from prior years, please click here.